Happy Friday – and only 10 days until Christmas! I hope you’ve been able to relax a little bit this season, that you haven’t been running about frantic during the pre-Christmas rush, or stuck in among crowds of people – unless that’s your Thing and that’s the way you like it! The whole noise of the secular Christmas season is not really my thing. I love this time of year, but within a very limited sphere of operation. I have two antidotes to the frantic pace of the outlying commercial world that permeates the weeks between Thanksgiving and Christmas in the US: The first one, is, of course, my needle and thread. There’s nothing quite as calming to me as escaping for an hour behind an embroidery hoop! But then, I do live in Kansas. So what else is there to do? Tying up the whole Twelve Trees for Christmas thing after launching the e-book on December 1st, I wanted to share a free pattern with you today – to say a great big Thanks! to all who purchased Twelve Trees and to give you another to add to your collection! The design is for a tree I played around with but never quite got right. It didn’t quite make the final cut for Twelve Trees for Christmas. 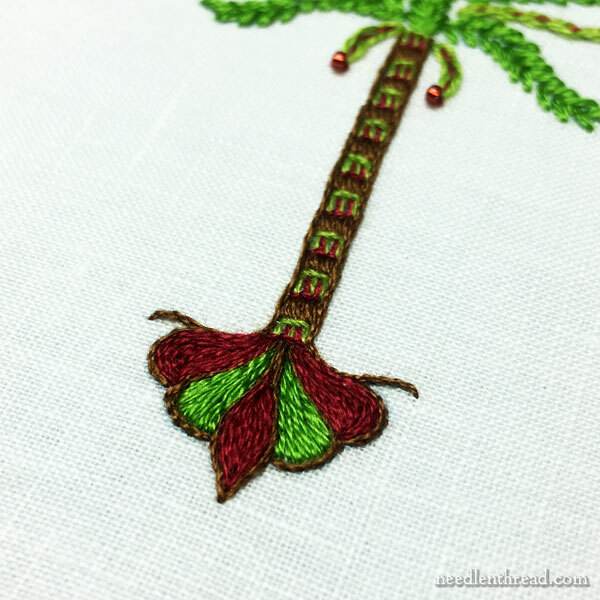 It’s a Christmas palm tree – a very stylized, somewhat whimsical (almost Dr. Seuss-ish?) Christmas palm tree! Eventually, I’ll play with this one again and get it right! Since stitching this version, I’ve adjusted the design and added a couple bent palm trees into the mix. I just haven’t had a chance to test stitch them again. 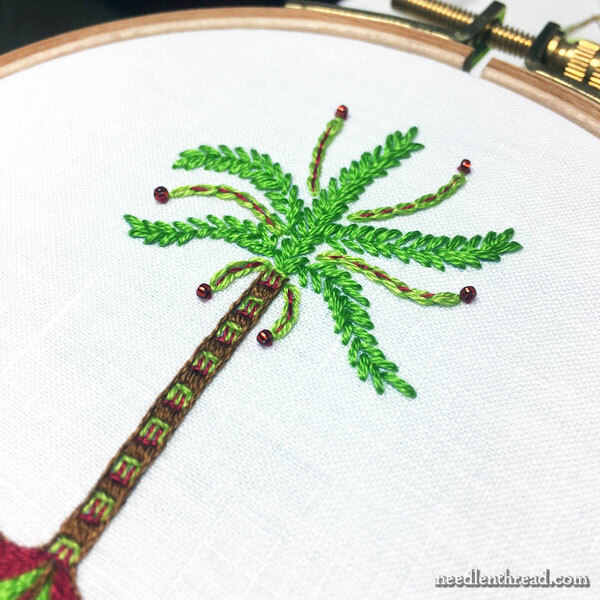 But since there are many, many, many stitchers in the world who live in areas where palm trees are a perfectly natural part of Christmas, and since I think palm trees are pretty cool in general, I thought this little collection of three palm tree patterns that you can stitch and decorate for Christmas would be fun! How you interpret your Christmas palm tree is entirely up to you! I could see it in tropical colors for a bright splash in holiday decor! If you’d like to try your hand at some Christmas palm trees, here are the patterns! The large one prints at slightly over 3″ tall, while the two bent palm trees print just at 3″ tall. If you trace the designs, remember that you don’t have to trace every single line – you can trace just enough to give you a clear pattern to stitch by. You can find more Trees for Christmas right here, if you’re yearning to stitch some fun, relaxing little trees that work up quickly! I was supposed to post a give-away for you today, but something came up, so I had to juggle my publishing schedule this morning. But it’ll be up tomorrow! And it’s a doozy for five winners, and packed with Inspiration! I’ll be overlapping the last of the Christmas Give-Aways in A Stitcher’s Christmas. There are four exciting give-aways remaining, and we’ll be finished with them before Christmas Eve, so look out for them next week! If you’re looking for last minute Christmas gifts and you’re shopping through Amazon, don’t forget that you can visit Needle ‘n Thread and click through any of the Amazon book links or banner links at the top of any article, to access Amazon. Any shopping you do through my links provides a tiny kickback to Needle ‘n Thread, which is greatly appreciated! I hope you have a wonderful Friday, and I will see you tomorrow with the next episode in A Stitcher’s Christmas! Christmas in Latin America is in summer, so this Christmas palm tree is perfect, thank you! Mary…What a terrific little tree! I love it! Today it is less than 20 degrees fahrenheit (-7 celsius) outside and it is snowing like mad! This little palm tree is just what I need to feel a bit warmer! Thanks! I can definitely see this on a Christmas card saying “Christmas Greetings from California”. Thank you so much for sharing and a huge Thank You for all you do!! Have a very Merry Christmas and a Happy New Year!!! A lovely idea Christmas Palm Trees, especially for those who live in warmer climates. I don’t blame you for staying close to home It’s going so quick with the Christmas rush and lots of preparations and events I haven’t had time to do much embroidery but it will settle now as I’m almost done with events. I look forward to more of you generous give-aways in the next week. Thank you for sharing with us the palm tree patterns it is lovely. I hope you have a great weekend and look forward to tomorrow. Oh Mary this are perfect. As a stitcher from Florida this will definitely find a place here. Thanks!!!! I love the palm tree. However, I grew up around date palm trees. You show some stems, each with one lonely date on it. But dates come in bunches, like grapes! So there need to be bunches of grapes on the end of each stem (which is an excuse to use lots and lots of beads!). Thank you for this lovely pattern, I will certainly add it to my other 12. So love the palm tree, it’s so happy. Thank you. Thank you, Mary, it’s beautiful! I love how you’ve stitched the trunk. Tho not into embroidery…any more… I do enjoy your blog.. partly, perhaps, fueled by sharing Kansas as home…may you prosper in 2018.. both in health and profession. I love the little flourish at the roots. Looking at the pattern, I think the issue is the strand that goes straight up. Palm fronds grow around the trunk and flop down and the ones on top should stand up higher, but still curve towards the ground. These are all wiggly like tentacles, like a Christmas Sea Anemone. I have been looking all morning for a Christmas, kind of Chinoiserie, palm tree, and here it is exactly what I wanted. Why didnt I look here. This is the perfect addition to my christmas tree book I got from you, too! Thanks, Mary!!! I should have looked here first. I love this palm tree. Thank you so much. If you don’t mind my asking, what stitch did you use for the trunk? I used satin stitch for the brown blocks. For the red and green blocks, I used buttonhole stitch, worked opposite so the teeth fit into each other. Previous Previous post: Give-Away #5: Tree of Life Crewel Work Kit – for two! Next Next post: Give-Away #6: Inspirations All Around!